When the Renaissance brought sweeping changes to European culture, Italian fencing traditions also evolved, with a new focus on civilian swordplay. A new, uniquely Italian weapon and fencing style —that of the elegant rapier—swept across Europe; influencing most of the continent for well over a century, and laying the theory of Italian swordplay for the next three centuries. 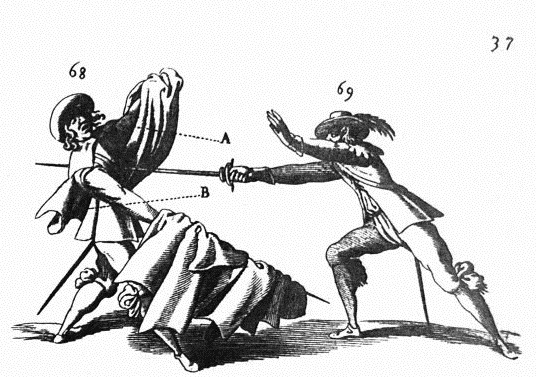 Now, you can take up the sword and study one of history’s most scientific and dangerous fighting arts, as taught by the early 17th-century fencing masters Salvatore Fabris and Ridolfo Capoferro. A rapier is a long-bladed sword with a complex hilt, optimized for the thrust but still capable of debilitating cuts. The blade is fairly thin and stiff, and counter-balanced to provide greater point control. Rapiers were neither light nor flimsy; a typical rapier of c.1600 had a blade of 42″ in length, a weight of 2.5 – 3 lbs, and was capable of parrying the blows of broad-bladed military swords. The rapier was generally used either alone, or in conjunction with the sidearms a gentleman would most likely have with him at all times: the cloak and dagger. In keeping with the advice of the ancient masters, you will begin with the sword alone, then add the dagger and cloak after your proficiency with the sword is developed. As you progress through our curriculum you will have the chance to study this ancient weapon, first alone, then with the buckler, and finally, against the rapier. As the sword evolved, so did the dagger. The Renaissance dagger was a large, double-edged weapon, with a hilt identical to that of a sword. You will not only learn how to use this deadly sidearm with the sword, but as your principle defense, fighting in dagger vs. dagger dueling, unarmed against the dagger, and with a particularly unique form, the cloak and dagger. Finally, the Renaissance arsenal was a diverse one, and senior students in the Renaissance Swordsmanship curriculum will also have a chance to study a variety of polearms, and the spadone – the massive, Italian two-handed sword. IS THE RENAISSANCE SWORDSMANSHIP PROGRAM RIGHT FOR ME?